What exactly is the target audience of “Land of the Lost”? I’ll admit that I assumed it would be a PG-rated family comedy going in. Little kids love dinosaur poop jokes, right? Much to be great surprise, “Land of the Lost” is not for kids. Sure, it sounds like it was written by a 12-year-old, but parents may blush at jokes about the only female character getting “wet” or sitting on a vibrating crystal. Even pre-teens will roll their eyes when Chaka gropes Holly for the fifteenth time. So, if the target audience isn’t families then it must be fans of the original TV show, a formula that has gotten Hollywood nowhere creatively. “The Beverly Hillbillies,” “The Flintstones,” “Bewitched,” and now “Land of the Lost” - why do they keep mining this well when it produces so little? The only positive thing I can say about “Land of the Lost” is that it’s so bad perhaps it will put an end to the classic-TV-to-film machine. Rick is rescued from his teaching hell by the gorgeous doctoral student Holly (Anna Friel of “Pushing Daisies”). She convinces him to take one more look at his theories of space and time and soon the two are in a remote cave with tour guide Will (Danny McBride) before being whisked off to a land stuck between times. With deadly dinosaurs, an ape-like creature named Chaka (Jorma Taccone), and even the deadly Sleestaks to contend with as they try to find their way home, the set-up for “Land of the Lost” seems primed for comedy action. The film that follows has very little of either. The biggest problem with “Land of the Lost” is one of the most episodic scripts in years. Perhaps it’s an ode to the film’s roots, but you half-expect each encounter to be followed by a commercial break. The script is simply a series of events in which these four characters run from some new CGI creation. And all of these encounters feature attempts at humor that land with a thud. Dr. Marshall drinks urine, gets sucked on by a giant prehistoric mosquito, and has an encounter with the other end of a T-Rex. Sound funny? And a scene where Rick, Will, and Chaka sit around getting high on ancient narcoleptics is a lowlight of not just the film but the year. It’s painfully unfunny. What saves “Land of the Lost” from 0-star disaster? Barely anything but the great cinematographer Dion Beebe (“Collateral”) does provide a unique funhouse look to the film. It’s just director Brad Silberling and his writers who don’t put anything actually “fun” in the cinematic ride. Then there’s Anna Friel. SO charming on “Pushing Daisies,” she tries to bring some of that same charisma to “Land of the Lost” but is completely stranded by her co-stars. Friel deserves better. A smart writer would craft this actress a great part soon before someone else does first. “Land of the Lost” feels like an inevitability more than anything remotely creative. It’s as if the great remake machine simply worked down the list until it got to one of the remaining TV shows not yet cinematically reinterpreted. And this was what was spit out the other end. Don’t buy it. Send it back. 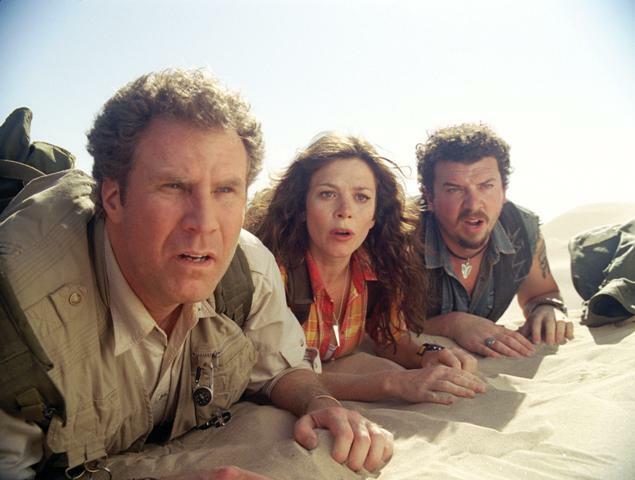 ‘Land of the Lost’ stars Will Ferrell, Danny McBride, Anna Friel, and Jorma Taccone. It was written by Chris Henchy & Dennis McNicholas and directed by Brad Silberling. It opens on June 5th, 2009. It is rated PG-13.